Closet purging and organizing is never fun but I have a different approach/method that I use for our closets that makes the process so much easier (and faster), without the indecision of what stays and what goes. I talk a lot about decluttering and purging in my book Organizing Your Life because I think the process of getting rid of things is where most of us get overwhelmed when it comes to organizing. 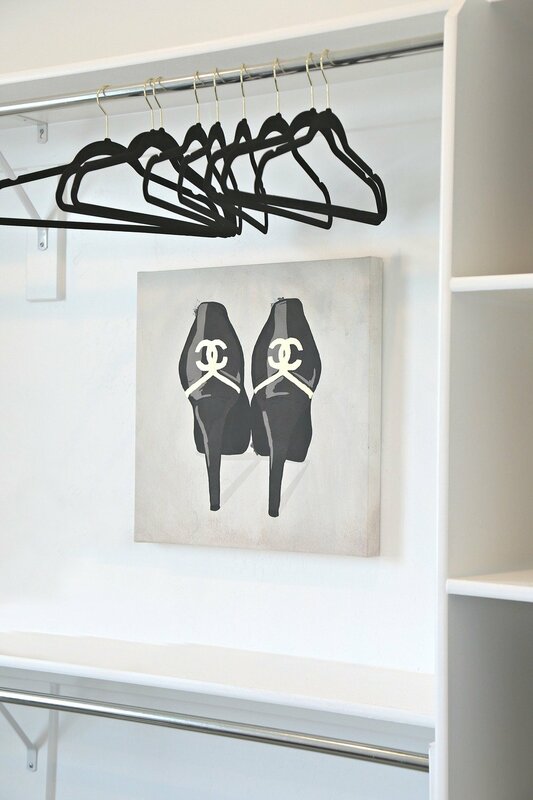 If you try my five steps listed below, I promise, you will be amazed at how fast, easy and smooth the closet decluttering and organizing process can be. I always give myself ground rules before I start to clean out and organizing a closet, attic or anything by telling myself that for each step (below), I will only spend “x” amount of time on the task. I also do not remove everything from the closet before I get started like so many professional organizers recommend. The worse thing you can do is remove everything before you organize because it’s overwhelming and harder to quickly look through to pull stuff. The other ground rule that I have when it comes to purging my own closet is that I do not try on things through the process! Who wants to power through a closet purge when you just tried on three pair of pants that you can’t come close to buttoning? It puts me in a bad mood and I will walk away from it (and go eat a cookie)! If you need to try on clothes, make it a separate task on another day with a glass of wine before you purge and organize. I begin by going through the closet starting on one end and working my way from one end of the closet to the other end, while removing everything that I know with certainty that I don’t want. I do this very quickly. For this first sweep, I pull out the pieces that I have no hesitation on and know it needs to go. If I have to think about something for more than 10-15 seconds, I move on and will deal with it later with the other steeps. I donate all of our clothes so I put everything in a garbage bag that I’m donating. After I’m done with my quick first sweep, I put the bag immediately in the back of my car for donation drop-off the next morning. The quicker it gets out of my home, in my car and to its final destination, there is no second guessing. In my home, I created space in an old armoire that I designate as my “uncertain closet”. The uncertain closet is for clothing/accessories/junk that I haven’t worn/used in years but I struggle to purge. These are usually pieces that may be too small or have fit issues. If you don’t have another closet in your home to designate an uncertain closet, you can use storage bins and store in basement/attic away from your closet. On the second sweep, I quickly pull clothing that I haven’t worn in years but that I hesitate to donate and I put them in my uncertain closet. I don’t agonize about it, I just pull anything that I don’t love, haven’t worn in a year but I’m just not quite ready to purge. I put these pieces in the uncertain closet because it gets it out of my main closet, frees up space and it begins the detachment process. After about a month or so, I go through and purge my uncertain closet and it’s amazing how I’m always ready to part and donate most of the items. It’s psychological because by getting these piece out of the closet for a period of time, I’m not as attached and can get rid of them easier. Read this next paragraph below twice! Skinny clothes, get rid of them! Do not hold on to them! If you lose 15-20 lbs, you will not want to be wearing something from 5 years ago! 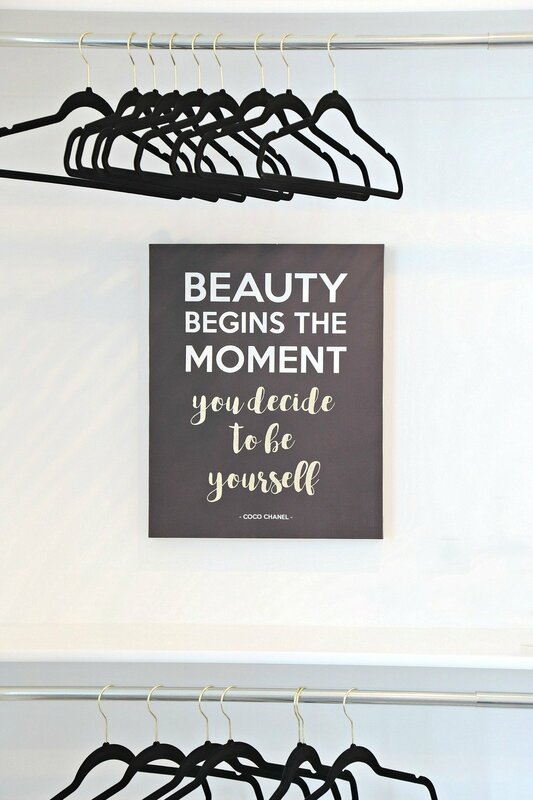 Trust me, if you lose weight, you will for sure want some fabulous new skinny jeans and outfits and the first thing you’ll do is go out shopping! Let it go friend, but do save one pair of skinny jeans for self satisfaction. There is nothing more fulfilling than getting in a pair of jeans that you couldn’t even get over your thigh at one point and time! I started putting my clothes in color order 20 years ago while working in the fashion industry. It just became automatic for me when putting clothes away in my closet because I was doing it everyday at work. The reason the stores do it is so you can instantly see your color options and it works the same way in your closet! The best part of having clothes in color order is that you can see exactly what your options are instead of turning a closet upside down wondering if you have found every black short sleeve top. Color coordinating also helps when it comes time to purge a closet because if you see that you have ten black skirts grouped together, you will be far more inclined to get rid of a few of the older pieces. If these pieces are tucked in and hiding throughout your closet, we are more inclined to hold on to stuff just to be safe. Putting clothes in color order is really easy and once you set it up the first time, you will be surprised at how automatic it will become for you to put a piece of clothing back in its spot. Over time, things will get mixed up some but if most of the items are in color order, it will just take a few minutes to sweep through and put everything back in place. It doesn’t really matter how you colorize them. Go the easiest route! You can think rainbow order or this is how I colorize: white, yellow, orange, coral, pink, red, light blue, blue, purple, brown, gray and black. After I have neatened up my closet and put things back where they belong in color order, I then do a final sweep and look at the clothes that I have an abundance of the same similar items. For instance, if I now see that I have ten white shirts, I try and see if I’m willing to part with any of them. Usually I don’t hesitate and I pull the older, dingier pieces. Depending on if I’m ready to donate them or if I need to think about it more, I’ll either put them in the donate bag or the uncertain closet. The key to this process is to force yourself to stay on each task/step and get through it quickly. Do not allow yourself to agonize over getting rid of something, just put it in your uncertain closet and deal with it later. Make the process fast and go with your first instinct. I hope you guys give this process a try and you see just how pain-free this process can actually be! I keep my jeans folded on my closet shelves and my work out clothes I keep in a drawer. The best thing I ever did was slip in an inexpensive Target dresser into my closet. It has helped so much! These are great tips. I am gonna check out your book too! These are great tips and I will be using them very soon.. I also have a great tip that has helped me a lot..Better Homes clear hanging over door storage. It has 24 large clear pockets. You can stores 5 to 6 leggins rolled up plus cami’s in each pocket..
Cyndy, your approach is so rational! My husband and I spent 90 days purging our entire home and barn before moving to Florida. That’s ridiculous when we should have been doing it routinely. Thanks for the great tips I will be implementing in our new home! I LOVE the uncertain closet! I think that will really work for me! Thank you! I love how clean it looks!! 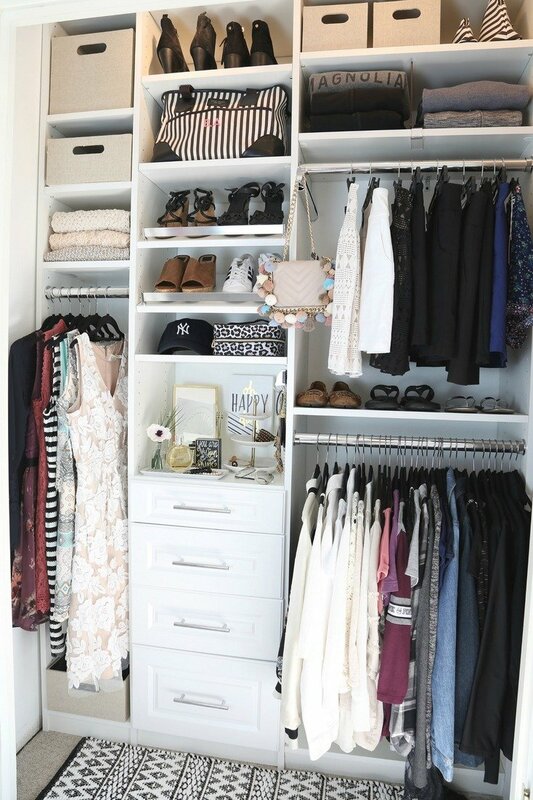 Where are the white bins from in your closet? I like those and would like to order some! The “uncertain” closet is a really good idea! Right now I have my stuff organized by type (skirts, jackets, tees…) but maybe I might try the color route. Thanks for all the great tips. I am in the process of doing this now so these tips came at a perfect time. Where can I find the rack you have for your necklaces/jewelry? It looks like it pulls out? Where did you get the bins?